When you’re involved in a right-turn car accident, who’s at fault? Was the police report inaccurate? How do you indefinitely prove that you’re not responsible for the accident? And how can you ensure you get fair compensation? Making a right turn on a street, road, or intersection is an everyday occurrence for anyone who drives, but it must still be done with caution and the driver’s full attention. Understanding your right of way and knowing that the accident was not your fault is the first step to determining how to proceed with your insurance claim and ask for fair compensation. We’re taught to be courteous and attentive in heavy traffic situations when we first learn how to drive, but making right turns has been programmed into our driving habits as such that we often make turns without taking proper precaution. Many accidents involving right-hand turns in Texas involve hitting a bicycle or pedestrian because the driver was not looking for them, and instead was looking only for cars coming the other way. In other common situations, drivers making a right-hand turn fail to calculate the speed of oncoming traffic, or think that an oncoming car will stop at yellow light that’s turning red, so they proceed anyway. When drivers are in doubt, they tend to make bad decisions. If you’re disputing a right-turn accident claim, make sure you didn’t act improperly by failing to yield. Yielding means letting the other vehicle pass when it’s not yet your time to go, or when it’s not safe to do so. In the case of right-hand turns, vehicles that are already on the roadway that you’re attempting to turn on have the right of way, unless they have a stop sign, traffic light, or traffic signal that tells them to stop. Even in the case of a speeding oncoming car, you should always yield before making a turn. In certain intersections in Texas, right-hand turns are only allowed on green lights, and there is signage to indicate as such. If you made a right-hand turn on a red signal when you were supposed to wait for a green light, you will likely be found responsible for the resulting accident. Similarly, if you rear-ended a car that pulled out in front of you making a right turn on a red light that was designated as green-turn-only, you likely have a strong case to recover a fair settlement. If you were involved in a right-turn accident and the other driver failed to yield you can likely recover different types of damages associated with your claim, including personal injury and property damage. Compensation can cover medical bills, short and long-term care, lost income, household expenses, vocational rehabilitation, and pain and suffering, depending on the nature of the accident. After the accident, avoid saying anything about the accident or who you think is to blame, especially to the at-fault driver’s insurance company. Avoid getting angry or baited into any type of statement that could be used against you. Instead, consult with a lawyer and cooperate with your insurance company. As soon as possible after the accident, take photographs of the damage to your vehicle, and write down as many details as you can remember about the accident. This information will be useful when filing your claim and if you choose to file suit later on. If you were hurt in the accident and didn’t seek immediate medical treatment for your injuries, you should visit a doctor right away. This will ensure that you get the appropriate medical help you need to get better and document your injuries and treatment. If the at-fault driver’s insurance company calls to ask for statement (they may say it’s necessary to process your claim), we recommend that you don’t say anything until you hire a lawyer. Insurance companies are notorious for asking questions that will later help them avoid paying out fair settlements. 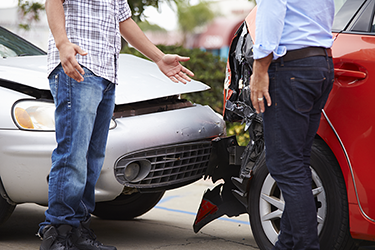 If the insurer blames you for the accident, or if they believe it’s unclear who caused the accident or who had the right away, you should consider contacting an attorney right away. Attorneys can help you reconstruct the scene of an accident in a much more sophisticated way than what’s available in a police report or personal testimony.